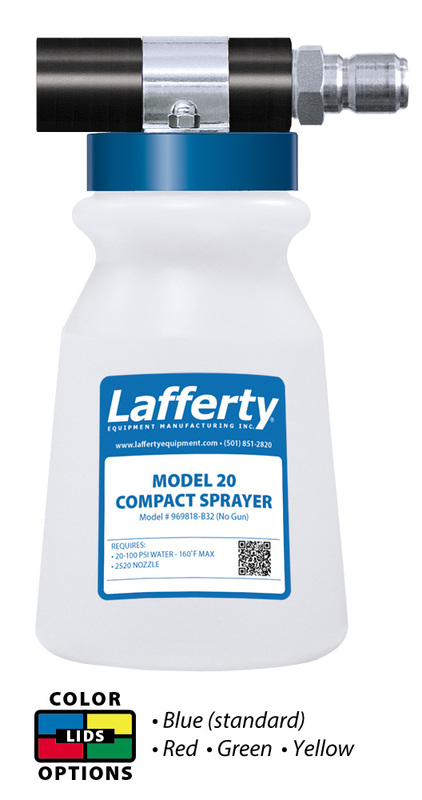 Model 20 Compact Sprayer (No Gun) | Lafferty Equipment Manufacturing, Inc. The Model 20 Compact Sprayer is a low volume hose-end spray applicator for diluting and applying chemicals to any surface up close or at a distance. This unit uses standard city water pressure to draw chemical concentrate from the attached bottle and blend it into the water stream. This accurately diluted solution is then projected through the recessed fan nozzle. This handy sprayer is offered without a trigger gun and can be used in conjunction with the gun on another compact unit. Use it with a Compact Foamer to easily switch between foam, rinse and spray using a single hose and trigger gun.